In 2013, Racey, Nathan, Chad and Gwen founded Reber Rock Farm in Essex, NY, hoping to help provide delicious, healthy, affordable food for the Essex foodscape and beyond on their small draft-powered farm. This past September, Racey and Nathan's wedding celebration took place in the barn on their farm. It was a beautiful wedding, full of good food, friends, community, and a perfect setting. On February 27th, 2016, Reber Rock Farm's newly-raised barn caught fire and burned to the ground. 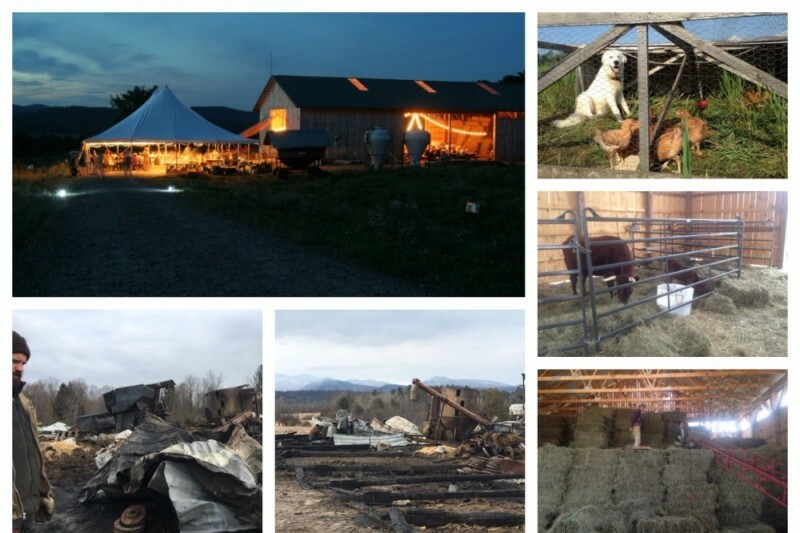 In the fire, Reber Rock Farm lost a newborn calf, their laying hens, tools, equipment, hay, and grain. Their livestock guardian dog, Piggles, was injured. Update 3/4: Piggles is doing much better! RRF is so thankful for the outpouring of support from their caring community; many many people have already done so much, and others are asking how they can help. Funds given here will help RRF rebuild the barn and replace equipment, supplies and animals lost or damaged in the fire. Any and all gifts are greatly appreciated. Please help them get back to doing what they love so they can give back to that same loving community. If you'd like to have the full amount of your donation go to RRF, please mail a check made out to Reber Rock Farm to 1699 Jersey St., Essex, NY, 12936. Check out this wonderful video showcasing the construction of the beautiful barn that was destroyed in the fire. Wait for your invitation to be part of building the new one! To all the many generous folks who have supported us through donations of time, money, thoughts and words: thank you. We are very sorry it has take us so long to send out these words of gratitude. Please know that everyday we are grateful for all the support we have received, which has made it possible for our farm and business to continue this year. To follow is a brief summary of some of the many ways we have been blessed with help throughout the year, and an attempt to convey how deeply we appreciate all of your support. We once again have a barn full of hay, equipment and tools as we head into our fourth winter. We would like to give a summary of how our recovery from the fire has progressed and some of the improvements we've made along the way. The first task was to cleanup! Who knew what a mess fire can make. We started by removing all of the debris from the old barn, including the cement pad in the shop area, which was severely pitted and cracked from the heat of exploding acetylene tanks, gasoline, used oil and other flammables. We had lots of help from friends and neighbors during the cleanup, and Essex Farm even came with their whole crew to help for a day. Before starting work on building a new barn we were able to purchase a "solar barn" with the help of our insurance and the generosity of folks who donated using GoFundMe and other means. This type of barn is very quick to erect, is made of metal tubing, similar to a greenhouse and then covered with a heavy duty white plastic that lets lots of natural light in. Since we lost any place to put something that we didn't want to get rained/snowed on this structure was a huge help. It took about a week to get the site ready, and thanks to my cousin Jake and his friend Gram for all their help preparing to build the structure. Then with the help of the first of many work parties attended by friends and neighbors we were able to erect and skin the solar barn in a day! With a place to put a few tools and keep our hay dry we were ready to start on the new barn. One of the fortuitous building choices we made the first time around was using concrete piers as the foundation of the barn. These are concrete columns that go down below our frostline and hold the posts that support the barn. During the fire, the wooden frame of the barn was completely destroyed, however the foundation remained in tact! So we decided to use the existing foundation and add a concrete pad for the entire floor of the barn. We poured the floor of the barn in two days with the help of many skilled hands of friends and neighbors, it took more than 90 yards of concrete, that's 9 concrete trucks! We installed insulation under the shop area with pex tubing for radiant floor heating to keep our hands warm when working in the shop in winter months! Now that the the floor was smooth and hard we called in the troops from far away. The Beatty family, every year makes an effort to come together and see each other, this year they brought my aunts, uncles, cousins and more to the farm for a weekend of fun, work, Passover and time of remembrance of the recent passing of Nancy Swett. Nancy's spirit was all over the barn as we lifted poles and mounted headers. Her energy lives on in our barn and her name lives on in one of our foals born just a few days after family had left. We have a wonderful young filly named Reber Donald Nancy (the first part refers to our breeding prefix and her sire). After the walls were up the barn was ready for trusses! To make more use of the space in the barn we purchased attic trusses for half of the barn. In the pictures of the barn as we set the trusses you can see that on one half the trusses are much closer together. Those are the attic trusses, they have a large room built into them that Racey and Gwen hope might someday be a yoga space! Three years ago when we built the first barn we had the pleasure of meeting and getting to know Doug Kerr and his wife Holly Stretch. Doug is a crane operator and was recommended to us by a few different sources. It was a pleasure to have him here again, and I think we even beat or time record from last time! With the trusses up, the roof was quick to follow. Next came the siding and in a last push before the farming season took over our lives my dad and good family friend Woody came up for a week and we built the interior wall defining the shop space and began insulating the walls. With the shop wall insulation done, the barn roof and siding ready to keep things dry we went to work making hay and keeping the farm running. It is now December, hay is in the barn, fall grains are planted and covered in snow, and the beef and pork has been butchered and most folks have it in their freezers by now. We made a fantastic push to enclose the shop area in the barn, with windows and a large overhead door! We've already appreciated a semi warm place to work when things break and our fingers and toes thank you all for the warmth. A short video of the barn rebuild! Wonderful video and story! Thank you, and CONGRATULATIONS to all on all you've accomplished!!! HAPPY NEW YEAR!! !